When was the last time you flew on an airplane? For many people, flying has become a transportation nuisance. Long lines, security checkpoints, additional fees and regulations… and that’s even before you board the plane! As I made my way back home flying from one coast to the other, I directed my attention to the flight attendants. Back and forth, up and down the aisles they worked. But I took time to really NOTICE them. They were bound by the same restrictions we had in flying, and yet they had to serve us with a smile no matter what baggage (literally and figuratively) we brought on board. Two seats up the gal complained about the temperature. “Why does it have to be so COLD on here?” The flight attendant showed her how to adjust the air vent above her seat. Another lady couldn’t figure out the headphones. “But WHERE do I plug this in?” As I sat on my first flight home, I became very aware of all the services flight attendants provide that require patience and kindness. Whether it was cleaning up a drink spill on a person’s tray or simply making eye contact to ask, “Can I get you anything else?”, these flight attendants were doing a great job to make my travel a little more enjoyable. On my final flight of the day, after already traveling more than 10 hours, I was weary. I’m always amazed how tiring just sitting can be sometimes. My back was starting to ache, my legs were becoming numb, and I just wanted to get home. (Or maybe it was turning 40 that made me feel so exhausted? Ha!) My last flight was a short one, from Newark to Richmond, and not even half of the plane was full. I was tempted to just close my eyes and sleep the entire flight, but I was once again directed to the flight attendants. This gal was just as friendly and kind as the ones on the previous flight. “I don’t have hot chocolate, but I can get you hot tea.” Her name was Cynthia and something about the way she came back to check on each of the people under her charge made me want to do something to show my appreciation. Then I knew! She could be my next Random Act of Kindness! I had purchased a bag of M&Ms in case I got hungry during the flight, but right in that moment I knew it was meant for her. I quickly pulled the candy out of my bag and wrote a note on the back of my business card. 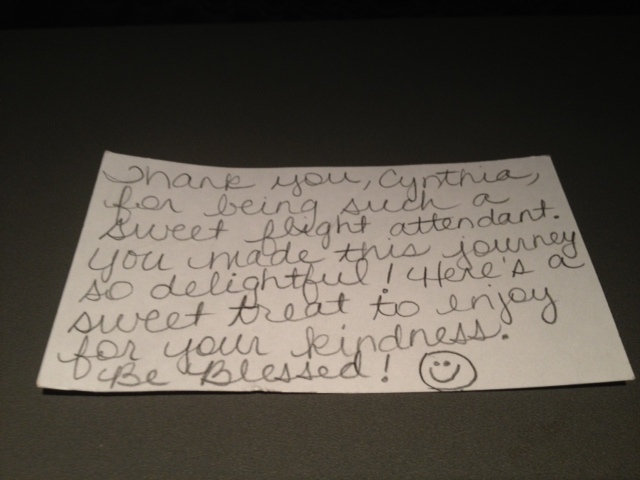 As we landed and disembarked the plane, I left the note and the candy in my seat for Cynthia to discover after I was long gone. It made me happy to know that even if she didn’t like M&Ms, she would know that her kindness was appreciated. Ordinarily, this is where my random act of kindness post would end. I rarely hear back from any of the strangers I bless after the RAOK has been done. But this evening was an exception. 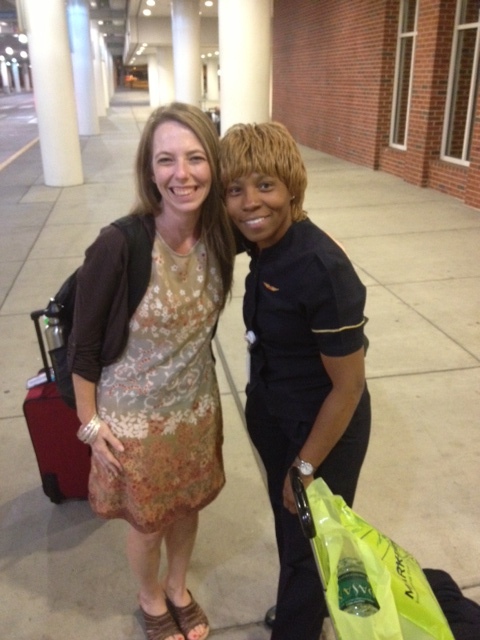 As I was making my way through baggage claim, waiting outside to be picked up by my husband and kids, I heard someone say, “That’s her!” Turning to see what was going on, I saw the flight attendant waving to me, flanked by pilots on each side. “Did you leave me a little something on that plane?” she asked. I started laughing and said, “I did! I just wanted you to know that you were doing a great job and I appreciated all your kindness!” We chatted a little more, laughing the entire time, and took photos with her camera and mine. She then said, “Well, if we knew it was your birthday, we would have sang the Happy Birthday song to you on the flight!” That just got us laughing even more. “No, no, that’s OK! 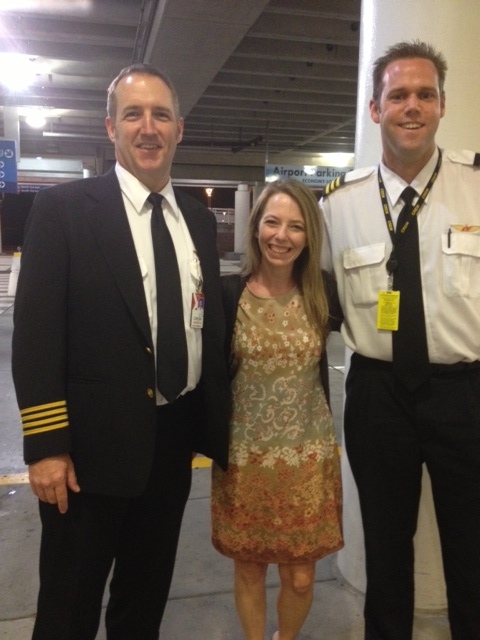 No singing needed!” She then asked if I wanted a picture with the pilots. Well… SURE! Who in their right mind would turn down that photo op? Once again, my blessing for someone else turned out to be a blessing to me instead. After all the photos were done, I turned around to discover my entire family watching the events unfold. I think that’s one of the neatest things about doing random acts of kindness – not only are you and the recipient being blessed by generosity, but all those around you observing the action are being blessed as well. It truly is a domino effect! So the next time you are planning a trip to fly the friendly skies, you may want to pick up an extra bag of candy or snacks. 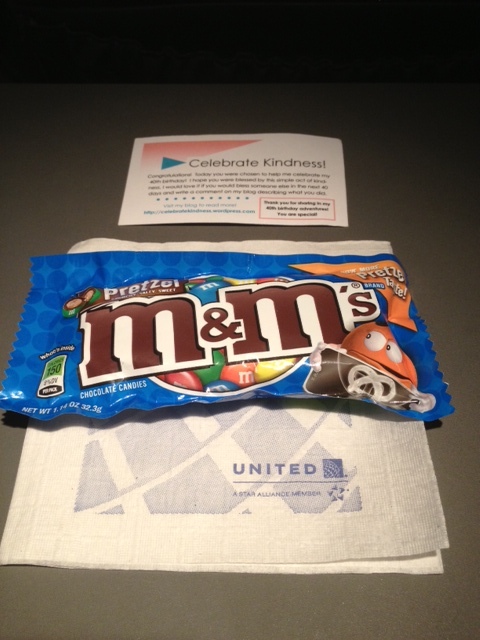 You never know who might need a little pick-me-up along the journey! 1 Response to "Random Act of Kindness #21"